Deepwater Wind will assemble the wind turbine foundations for its Revolution Wind in Massachusetts, and it has identified three South Coast cities – New Bedford, Fall River and Somerset – as possible locations for this major fabrication activity, the company is announcing today. Deepwater Wind is committed to building a local workforce and supply chain for its 400-megawatt Revolution Wind project, now under review by state and utility officials. Today’s announcements represent the next steps in Deepwater Wind’s plans to create 2,300 regional jobs and nearly $300 millionin regional economic impact. The construction activity will involve welding, assembly, painting, commissioning and related work for the 1,500-ton steel foundations supporting the turbine towers. This foundation-related work will create more than 300 direct jobs for local construction workers during Revolution Wind’s construction period. An additional 600 indirect and induced jobs will support this effort. The company will issue a formal Request for Information to local suppliers in the coming weeks. Deepwater Wind’s additional wind farms serving Massachusetts will require the construction of additional vessels. These commitments are in addition to Deepwater Wind’s previously-announced plans to use the New Bedford Marine Commerce Terminal for significant construction and staging operations, and to pay $500,000 per year to the New Bedford Port Authority to use the facility. During construction, the turbine marshaling activity in New Bedford is expected to support approximately 700 direct regional construction jobs. The Revolution Wind project will be built in Deepwater Wind’s federal lease site southwest of Martha’s Vineyard. If approved, local construction work on Revolution Wind would begin in 2020, with the project in operations in 2023. Survey work is already underway at Deepwater Wind’s offshore lease area. Revolution Wind will deliver “baseload” power, allowing a utility-scale renewable energy project for the first time to replace the retiring fossil fuel-fired power plants closing across the region. Revolution Wind will be capable of delivering clean energy to Massachusetts utilities when it’s needed most, during peak hours of demand on the regional electric grid. A partnership with FirstLight Power, using its Northfield Mountain hydroelectric pumped storage in Northfield, Massachusetts, makes this peak power offering possible. This is the largest pairing of hydroelectric pumped storage and offshore wind in the world. The Revolution Wind offshore wind farm will also be paired with a first-of-its-kind offshore transmission backbone. Deepwater Wind is partnering with National Grid Ventures on an expandable offshore transmission network that supports not just Revolution Wind, but also future offshore wind farms, even if they’re built by our competitors. This cooperation is in the best interest of Massachusetts electric customers because it will reduce the amount of electrical infrastructure needed to support the state’s 1,600 MW offshore wind goal. 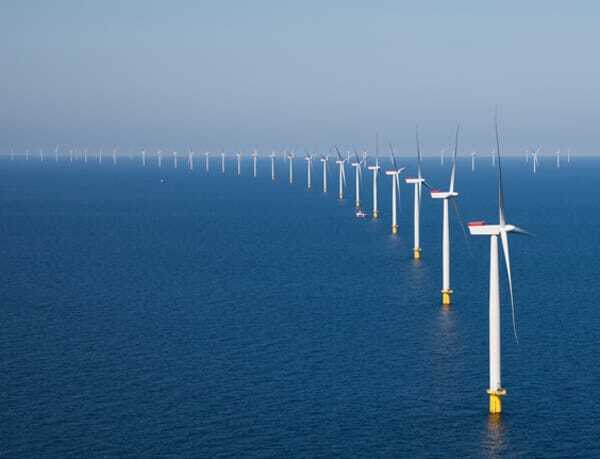 Instead of each subsequent developer building its own standalone cable network, other offshore wind companies could use expandable infrastructure already installed for Revolution Wind, reducing project costs and saving ratepayers money.